“We knew we wanted a German handleless kitchen and spoke to many different retailers. When we went to Vogue, not only could we tell the product was simply better (more detailed, better quality), but Jo's knowledge of what he's selling and Vogue's design ability is truly second to none. He knows his product so well and also knows all the latest appliances and worktops. With other designers, we just didn't get the same feeling. With Vogue, they put their actual work all on their website and the quality of the designs and fitting speaks for itself. Other retailers just couldn’t showcase us the same quantity and quality of work. When it came to fitting, Vogue’s fitters are truly outstanding – the kind of people to whom each last millimetre of accuracy is important. “Jo, Sharan and the team delivered an absolutely wonderful kitchen to us recently. The service was impeccable and couldn’t be faulted. Not only did they design the Kitchen; they put full thought into the redesign of our entire living space making the Kitchen a multi-functional space. Now the Kitchen is the hub or home from day to day living to entertaining our family and friends. "I’m very keen on combining the indoor with the outdoor, the house needed to be opened up. I wanted it to seem as if the kitchen was outside and vice versa and that’s where the idea came for the interior and exterior circular tiled floor pattern. It draws the kitchen outside and the garden in. 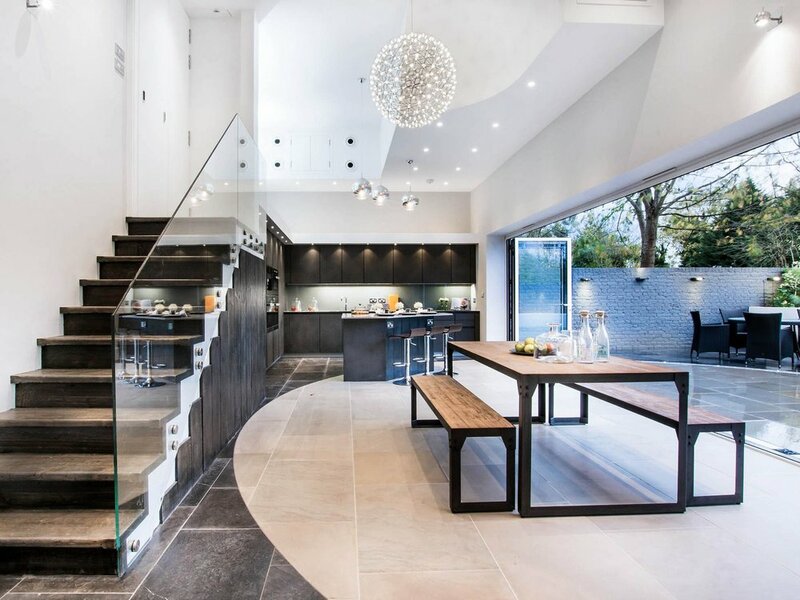 While the inside-outside feel was important, this job was unusual as the kitchen and living space is enormous, so it required a bold design - something that would stand out on its own but also tie in with the circular floor, which the island does perfectly. The design also needed it to be sleek enough to prevent the kitchen becoming oppressive, with a modern, furniture feel, which Jo & Sharan have pulled off really well! It harmonises beautifully in the space, as the doors are finished in mock polished plaster and the wall behind the spiral staircase in the hallway is actual polished plaster in the same colour." “We are very pleased that we chose Vogue Kitchens, Sharan & Jo really know their stuff and nothing was too much trouble for them. "This is the second time we have used Jo & Sharan to design our kitchens. Both times Jo and his team understood the needs of our family and how we use our kitchen space and helped us design a kitchen that suited our lifestyle. The quality and value for money is great as well as the after sales service. We highly recommend for anyone wanting to buy a luxury kitchen." "Having approach three companies with the exact same requirements brief, I chose Vogue. I am extremely delighted that I did. My choice was not based solely on £’s (as all quotes were comparable being the exact same kitchen brief). The owners (Sharan and Jo) are super supportive, personable and logistical. They had my vision at heart and went above and beyond to make it a reality. Their designer (Gergana) is world class of whom Richard Rogers would be envious of. Their project manager (Maurice) ensures every step of the process is diligently well managed and viable. Their fitter is not ‘just’ a fitter, he is a precision engineer. If you need a kitchen, it’s a no-brainer, go with Vogue." "After seeing other kitchen designers we decided to go with Jo and his team and I can honestly say it was the best decision we made. The design provided was exactly what we were after, the service exemplary and everything worked better than expected. You just have to see their portfolio to see great examples of their work. We have recommended Vogue to our friends and have no hesitation in recommending them." “Absolutely amazing!!! 😀That’s the first words that spring to mind when we describe our kitchen. What we have achieved is a luxurious sophisticated and faultless kitchen. After our first meeting with Sharon and Jo we found them to be very enthusiastic and committed to making our dream come true. In terms of designing Sharon can definitely visualise what we needed and executed it into a fab design. From placing the order we found the service Vogue kitchens gave was tremendous, we had regular site visits to ensure all the service points and measurements were correct and advice and support was given regularly by email and telephone. The kitchen fitter they sent (Don) was excellent and his work was very tidy and clean and perfection was second to none . "Jo and the team were first class in everything they did with us, from the initial design conversations all the way through to installation and finishing touches, taking care of every detail. What really struck me about Jo was that this was a partnership from the outset, he wasn’t trying to just push his own ideas, it was a team effort blending what we wanted and leveraging his vast expertise; plus he cared about what the whole room looked like not just the kitchen element and was full of useful tips and advice. He also formed an excellent relationship with my builder, and his installer Don was simply superb; as were the guys who fitted the work surfaces. 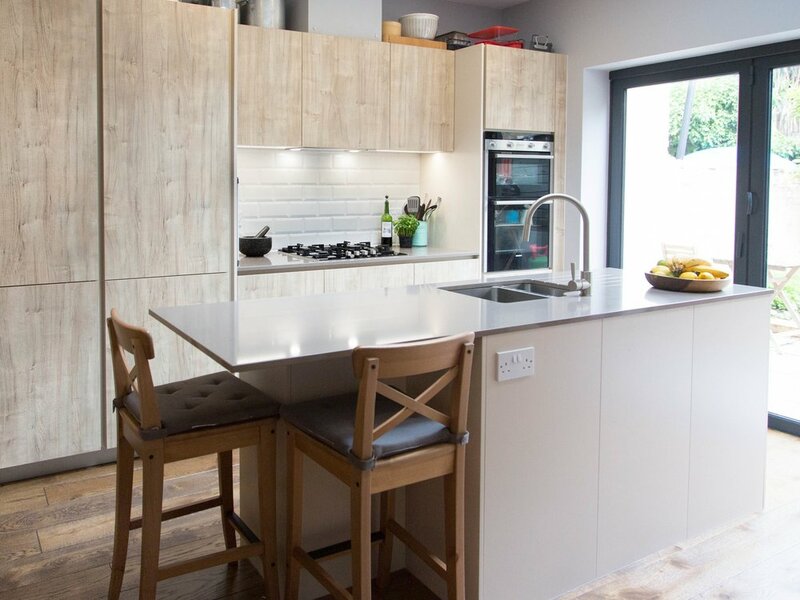 “A chance encounter at the Ideal Home Show in 2017 led to us booking a consultation with Jo at Vogue Kitchens (we had previously seen their work on their website but assumed that they would not be able to meet our budget). Having been to many other consultations with a range of kitchen designers / suppliers from the large chains to smaller independents, we were sceptical about yet another kitchen designer wanting to push their kitchen on us. We couldn’t have been more wrong. The consultation was handled professionally with Jo listening carefully to our needs, how we were using the space and what we wanted aesthetically. Not only did he listen carefully, he also provided some excellent suggestions and produced a rendered photo design which really helped us visualise the kitchen ~ something that other kitchen designers could not help us achieve. Moreover, Jo produced a design with a quote that was highly competitive and to our delight, within our budget. The kitchen fitting itself was handled exceptionally well. The absolute attention to the minute detail down to the millimetre (as a previous reviewer has commented) was a joy to watch. The fitter was a true craftsman and we felt very reassured and happy with his work. "Sharan and her team gave invaluable advice and guidance in bringing our dream kitchen to reality. By taking our ideas on board in a methodical way, Sharan ensured that we left nothing to chance and used her experience to ensure that we based our design on our kitchen habits rather than being forced to change our experience. The visual presentation of our proposed kitchen was simply stunning and we couldn’t wait to get started!! Being a tinkerer, I made many tweaks up until the point where we signed on the dotted line. I appreciate that late tweaks and changes to the design are never helpful, but Sharan to her credit accommodated each one with a smile and always remained very helpful and completely took the stress out of the situation. Once signed, she handed the reigns over to her husband Jo. Let me be honest, our builders were not the easiest to communicate with, but Jo to his credit attended our home many times and confirmed the site remained within scope of the new kitchen. Where changes were necessary due to building oversites, Jo would take time out with the builders and ensured they understood the kitchen requirements. I was hands-on with the whole process, and like Sharan, Jo remained attentive to my queries and was always available for a chat, even whilst he was hosting at the Ideal Home exhibition! Ultimately, people buy off people and with Sharan and Jo, I never regretted my decision in buying from them. They were great throughout and took the stress out of a particularly stressful time." "Now that our new kitchen is completed and fully operational, I think it's only fair to write and express our immense thanks, gratitude and congratulations to Jo & Sharan personally for all your care, consideration, expertise, professionalism and for providing an excellent product. From the very outset, when we approached you to discuss the possibilities of a new kitchen in our new property, you put yourself out to meet our needs. You were assiduous in discussing both the design and product options, and pointing all the choices that were not just relevant for today but also future proofed for the years ahead. You provided a professional attitude to all aspects of the installation from initial client consultation through to snagging and with completion ahead of time and with zero hidden costs. We were very impressed indeed and cannot over-praise your personal service, expertise, customer care and dedication. We would whole heartedly recommend you to anyone, as I am one of those awkward customers who expects near perfection in such undertakings and I can assure you that your work is truly excellent and exceeded all expectations. We absolutely love our kitchen. Thank you so much Jo, Sharan and Team." "We had our kitchen designed and fitted and it's wonderful. The designer worked with us to give us a kitchen that not only looks amazing but works fantastically for our family. The kitchen is the hub of our home and we couldn't be happier with it, and wouldn't hesitate to recommend. Best Kitchen designers in the business. If you have come across Vogue kitchens then believe me, you need not look elsewhere! We were looking for a new kitchen last year and visited various kitchen companies. After researching for the best companies and best materials, we made up our minds to go for a German handle less kitchen. We felt that in general there was a very dull atmosphere and restrictions on things that you could or couldn't do with regards to design and features. This was a bit disappointing for us as we were starting from scratch and wanted some freedom of design. Then we came across Jo and Sharan from Vogue Kitchens and found them to be miles ahead from others in terms of customer service and quality. From the initial meeting, they were extremely polite, understanding, helpful and made us feel unique. They have designed hundreds of kitchens in the past, but the way they gave us the individual attention was a great touch and we felt like a valued customer throughout the project. The first meeting was about understanding our needs from the kitchen and the use of it. Jo went into every detail and advised us on certain things, which we thank him till this day :-) For once, we had an experienced kitchen designer in Jo, who was not there to sell what he had, but wanted us to end up with a kitchen that worked for our family. Every choice/decision made was based on our needs rather than what was in the catalogue. This was very important as we ended up with exactly what we wanted without compromises. The designs were adjusted in follow up meetings and drawings sent to us were spot on. From the choice of colours, material and appliances, we were given all the options and made aware of the budget implication of all of them at the start, so that there were no nasty surprises. This is probably the best aspect of Vogue kitchens - transparency and clarity of the project progress at every stage. You can be rest assured that things will turn out exactly as you have ordered and for the price that you have agreed. Once the order was placed, we were kept in the loop of the lead times which were accurate. We had the fitting done from Vogue as well as we thought its better to leave this important aspect to the experts. The fitting went smoothly with attention to every detail. This was followed up by a site survey to make sure that the fitting was as per expectation. It was a very useful step of the process as it reassured Vogue kitchens' intentions of making sure that the quality was top notch. "Jo & Sharan and their team have been outstanding to work with! From the design stages right down to the installation of the kitchen we felt well advised, listened to and looked after. We are so pleased with our kitchen which offers the whole package - fantastically practical storage solutions and a great look!" "Our Leicht kitchen looks amazing; it feels like a dream has come true! We cannot thank Jo and Vogue Kitchens enough.When we visited the Vogue showroom, we went along purely to get ideas as we thought our project and budget would be too small for them to work with. We were wrong. What Vogue Kitchens were able to design for a small space (and within budget) left us speechless; it felt like a magician had been at work. It was the kitchen design, price and Jo’s wonderful way of conducting business (he is upfront, does not apply sales pressure, listens to your needs and is very knowledgeable) that helped us to choose Vogue. We were concerned that once the money had been paid, we would not receive the same level of service but true to his word, Jo was fantastic with accommodating changes, communicating delivery and fitting dates and answering any queries that we had. Even after the fitting, Jo has continued to help us with any questions that arise. "Love our new kitchen. Although quite expensive, the quality and range offered was much better than elsewhere we looked. There was less of the irritating sales pressure during the negotiations and design stage that we'd seen elsewhere. Staff were friendly and very helpful. The fitting was done smoothly and response to any subsequent snagging issues has been excellent with all being dealt with quickly and professionally." “Jo & Sharan have delivered us a kitchen with the WOW factor! They provided an excellent design service, putting in as much time as was necessary to design the perfect kitchen for us. 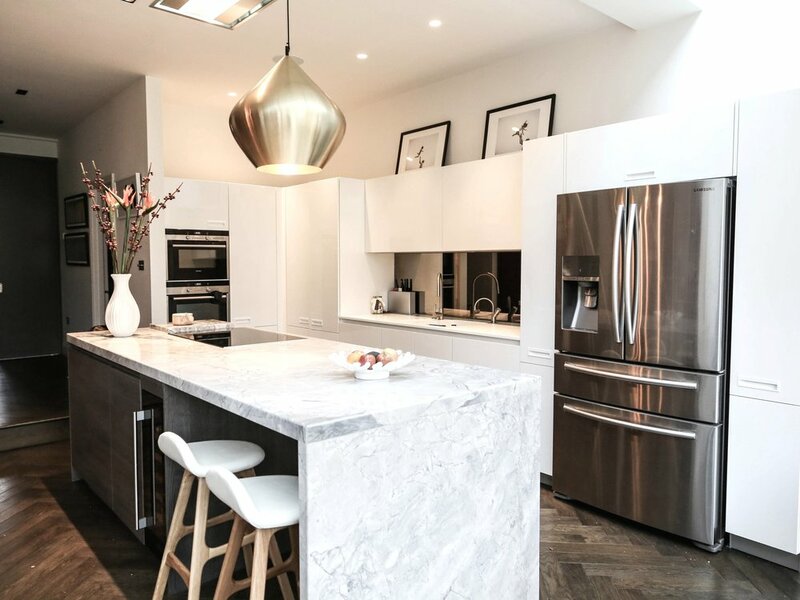 They have an eye for detail and a great talent for pulling together layout, co-ordinated colours, materials and appliances for a really user friendly, great looking kitchen. They suggested some super ideas, that we hadn't thought of, that have all worked brilliantly well in the kitchen. The kitchen fitting went so smoothly, the fitter was skilful and efficient. He did a really professional job and left the kitchen area sparkling clean and tidy, removing all rubbish from site. We are so delighted with the finished kitchen and would happily recommend to anyone planning a new kitchen." "The one thing I knew that was going to be perfect was my kitchen. Jo & Sharan provided me with all the key elements that I was looking for - confidence, honesty, vision, functionality and let's not forget a great fitted Kitchen! They delivered all of this and more, on time. I placed my trust in their hands and they never let me down. They provided great visual plans and even worked directly with my builders to ensure everything ran smoothly. Everything was stress free! I'm left with the Wow factor I was looking for and the kitchen blends in beautifully with the rest of my open plan lounge. A big thank you to everyone involved. You left me with a great experience and I would never hesitate to recommend you!" 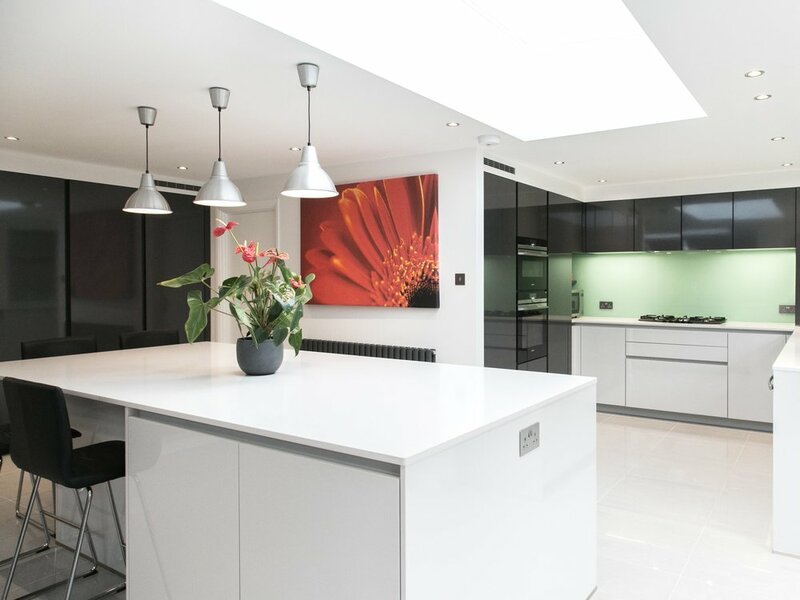 "We chose Vogue Kitchens to design and fit the kitchen for our new extension. On our first meeting, Sharan looked at our architect’s plans, and took time to find out how we used our existing ground-floor living space, how we intended to use the new extension, and how we cook. Sharan came back with two stunning designs that fitted our brief. We made a few tweaks to one of the designs, under Sharan’s expert guidance. 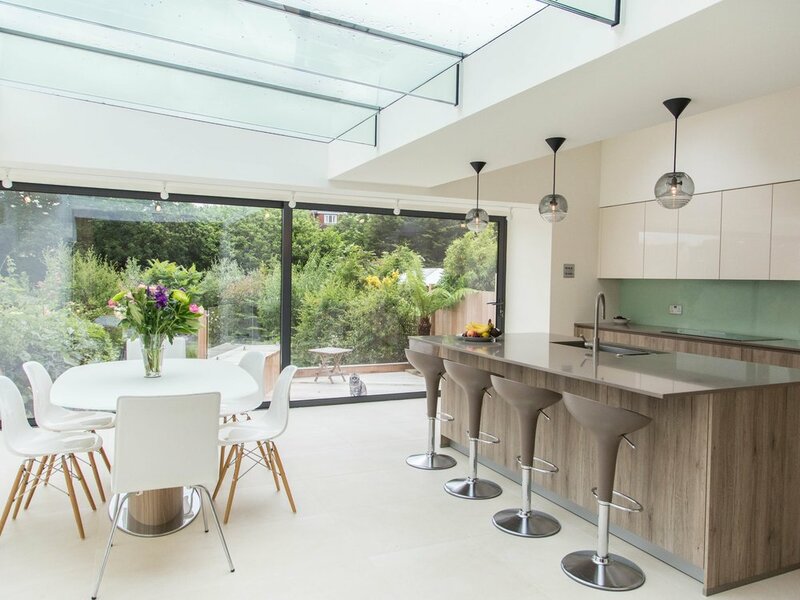 Sharan has a great design eye, and we used several of her design ideas for the extension.Jo and Sharan liaised directly with our builders at every critical stage of our extension to ensure that the final kitchen fitting would be problem-free and timely. The kitchen fitting went without a hitch, and the fitter, Don, was both efficient and friendly. We are pleased that we trusted Sharan, Jo and the Vogue team with the design and fitting of our new kitchen. Their professional and friendly approach was most welcome, particularly during the busy build period." 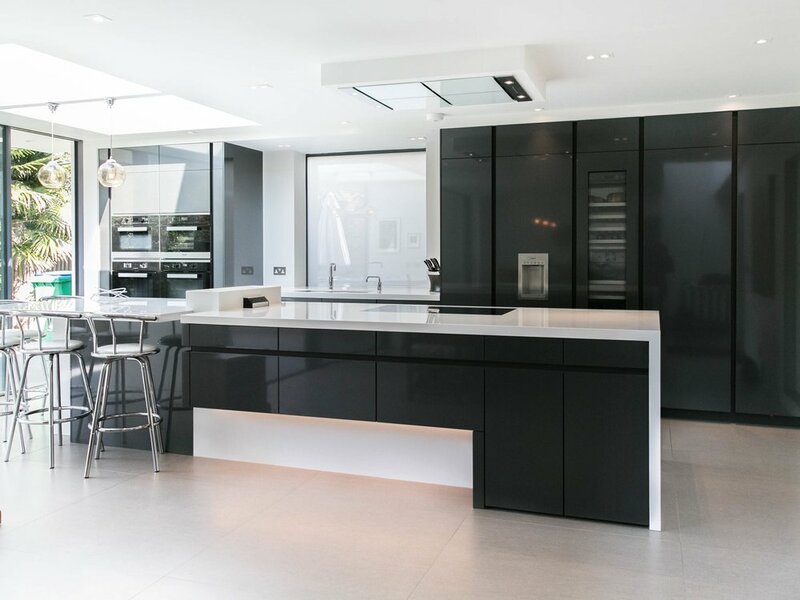 "I would highly recommend Vogue Kitchens, their service is second to none. From the time you walk into the showroom everyone there makes you feel comfortable, relaxed and you are given their undivided attention. 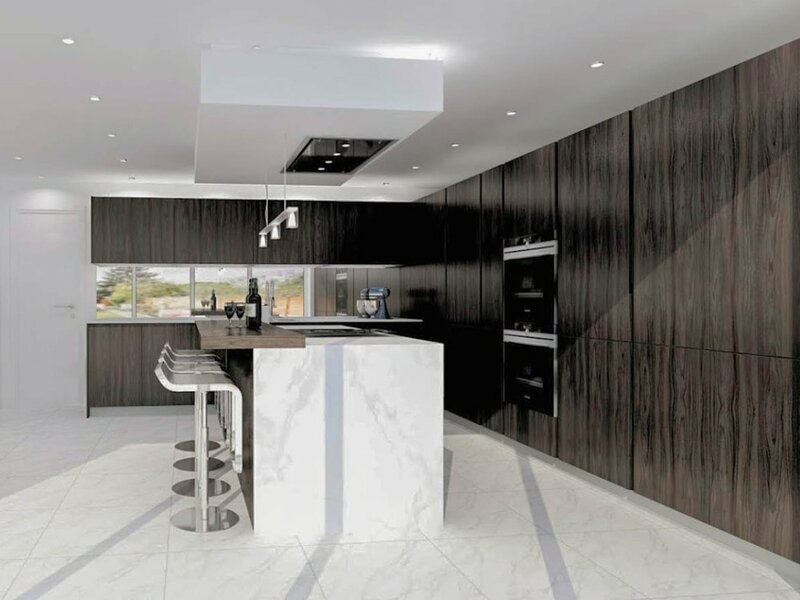 When I received the drawings & images of my new kitchen, I was very impressed with the attention to detail; it was obvious that during the consultation, Sharan had listened intently and answered my brief thoroughly. If you are thinking about purchasing a new kitchen, this is THE company to go to." 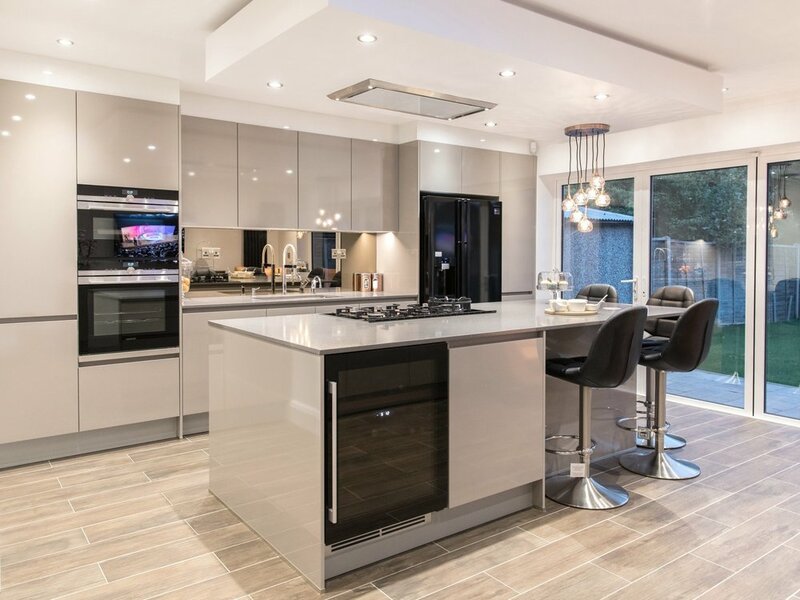 "I highly recommend Jo & Sharan, great experience from walking in to the showroom on the first day, having the kitchen designed and installed through to after sales service. Truly creative team, excellent product, skilled fitters, great customer care - worth every penny." "Beautiful kitchen designs and excellent service! 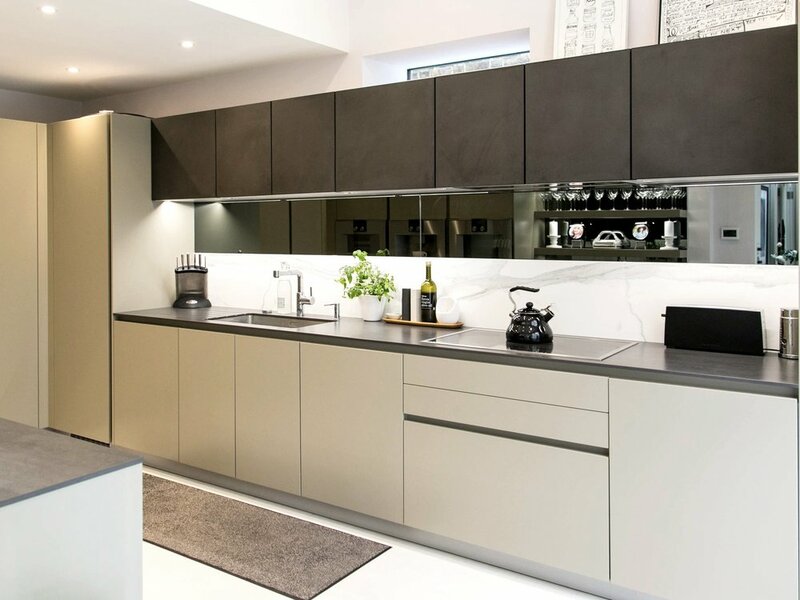 We visited the display at the ideal home show and went to the showroom thereafter to have a kitchen designed to suit our needs, style and budget. Delighted with the finished result and am loving using our new kitchen. Very Professional service and installation. Would definitely recommend." After a full years total house renovation, we have finally made it! The kitchen from Vogue Kitchens was the real WOW factor & we could not be any happier with the outcome. The consultations were of great benefit & the full kitchen rendering provided was a big plus as we were able to visualise exactly what our new 'bespoke' kitchen would look like. I am also glad to say that the fitting went to plan & was done in a single day with very few 'snags'. We live locally and have recently had our kitchen designed by Jo installed. We couldn't be happier with the service from our first appointment, deadlines met, clear pricing that was rigidly stuck to and both Jo and Sharan going above and beyond to make sure we were happy with our experience. Highly recommended.